Coming in a whole range of pinks and purples, the spring-flowering aubretias are ideal for growing at the front of a border, on rockeries and between the stones in walls, where they hang down to create the most fabulous blanket of colour. In certain lights, the lilac aubretias take on an incredibly vibrant luminescence, seeming to change colour with the light. Remember it behind the iris: it looked much darker there. Here it is growing with a pink saxifrage. After the flowers have faded, cut right back to the base. What a gorgeous shrub this is! Flowering very early in the year, sometimes as early as the end of February to the beginning of March, and right through to May, it makes a bold statement with it's striking flowers. 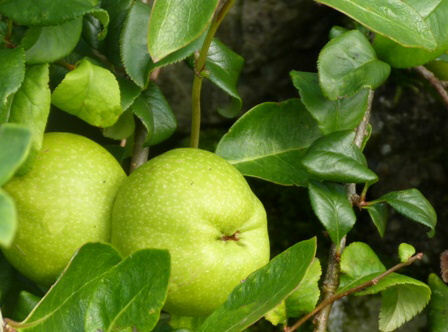 At the end of the summer, small quince fruits develop, which can be left for the birds to eat or made into jelly and preserves. 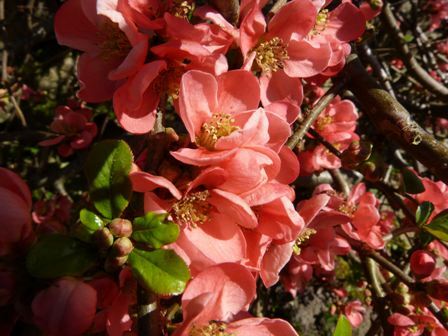 It's an ideal shrub for growing up against a wall or fence. I particularly like the deep, coral pink variety, although it is available in several different wonderful colours, usually pink, red and white. Bergenia is classed as a hardy perennial, but it does, in fact, keep its leaves all year round. 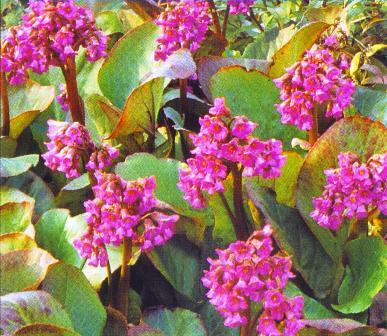 Commonly called elephants ears or roast beef, because of its large striking saucer-like leaves, this ground cover plant is usually grown for its architectural form. As an added bonus, beautiful pink florets appear in spring. Useful as a foil and contrast to smaller foliage plants, it looks very good at the edge of a border, or growing next to a garden pond. Very easy to grow. 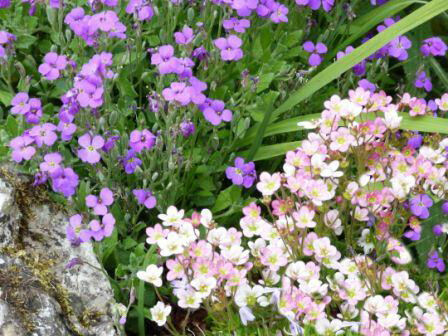 A lovely spring, ground cover plant that prduces swathes of striking colour colour in the border and rockery. Best planted in a slightly moist, shady spot, it will tolerate full sun. 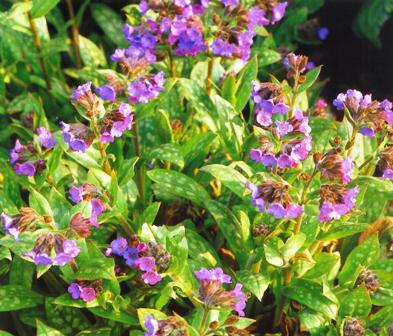 My favourites are pulmonaria 'Blue Ensign' for its gorgeous deep blue colour, and pulmonaria rubra, a wonderful deep coral pink. If you have a shady spot, and your not sure what to put in it, this is your man! I wouldn't be without herbs in my garden. Cooking with fresh herbs takes recipes to a new level! Not only that, herbs can grow quite contentedly amongst other plants. I plant golden majoram for its lime green colour as much as for culinary use. Rosemary has delicate, purple flowers, and sage, which can grow into quite a large plant, has useful grey-green or purple foliage. Raised beds or pots can be used to grow all herbs, too. Read more about how to create a simple raised bed here. Do be aware that some herbs are hardy and some are not. Herbs having more water content in their leaves and stems, such as basil and coriander will die at the first sign of frost, or even in cold, damp weather, so these are best left on the windowsill or in the consevatory when the weather changes. Which Plants and Flowers Do You Like Best? Sharing ideas is always great, especially where gardening is concerned, so it would be really good to hear about a favourite plant of yours. Do include a picture of it in all its glory, if you have one! Your ideas will appear the way you enter it here. Include interesting details later on. Do you have some pictures of your wonderful plant? Great!